Also known as Peter the Great Museum of Anthropology and Ethnography, the Kunstkamera in St Petersburg is in fact Russia's oldest museum, dating back to the early 18th century. What makes it a distinctly dark place is the part with the collection of anatomical specimens, in particular the “monsters”, i.e. 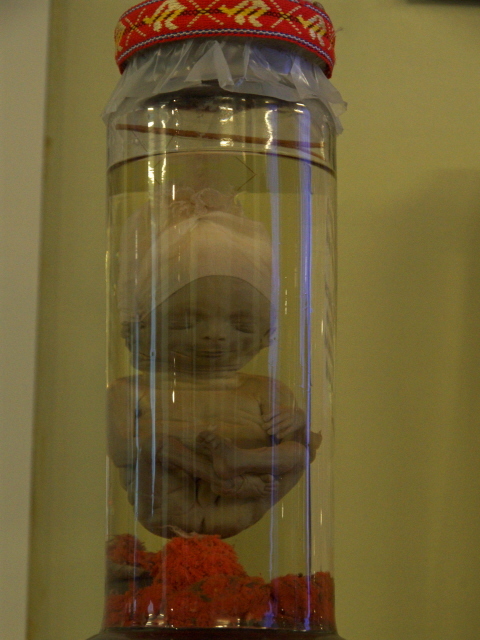 various deformed babies in formaldehyde jars. 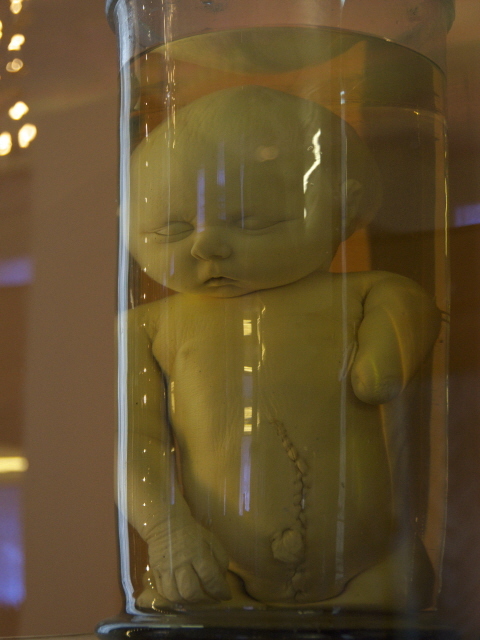 It is indeed one of the freakiest such collections in the world. 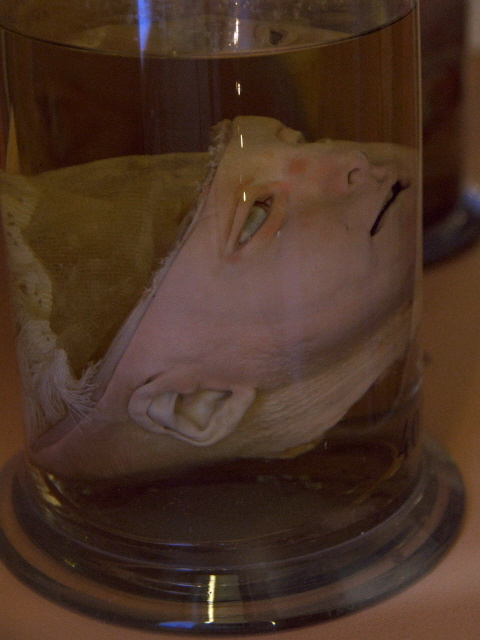 More background info: The anatomical collection may be regarded by many as a gruesome freak show these days, but that was far from the original intention. On the contrary, it was supposed to be scientific and educational. 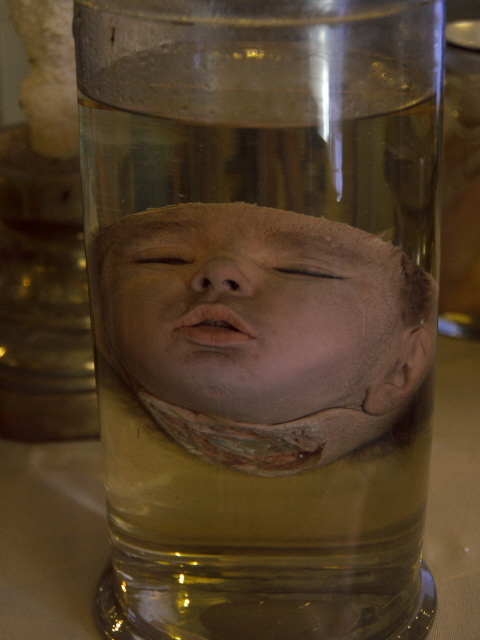 Tsar Peter the Great himself started the collection and even decreed that malformed stillborn babies should be sent in to augment the collection in order to demonstrate the various “accidents” of nature. The intention was rather to dispel the then current superstitions and beliefs in demons and monsters and such like. So this collection, just like the ethnographic collection showing different cultures, was meant to enlighten people. It was all part of Peter's general efforts as a reformer. This museum was in fact the very first to be established in Russia. The idea developed in the early 18th century, and the original purpose-built museum opened to the public in 1728. An additional museum wing was added in 1887. The original Kunstkamera was severely damaged by fire in the mid 18th century, so many features and parts of the collections are reconstructions. This also applies to the iconic central tower, which was only rebuilt in the 20th century. The name Kunstkamera, by the way, comes from the German/Dutch “Kunst” ('art') and “Kammer” ('chamber') – perhaps a strange choice of name given that Peter the Great wanted to display “naturalia” rather than “artificialia”. What there is to see: Once you manage to get inside and have paid your admission fee you want to get your bearings as there are several different parts of the museum. Most dark tourists (in fact the majority of all visitors, going by the relative numbers you encounter) will want to head straight up to the second floor to see the anatomical collection. It is in one large hall that is subdivided by rows of wooden display cabinets. If it is too crowded you may have to wait before you can see in – or else go on a haphazard route rather than doing the cabinets in a neat order (that's what I resorted to). What you get to see are skeletons, e.g. 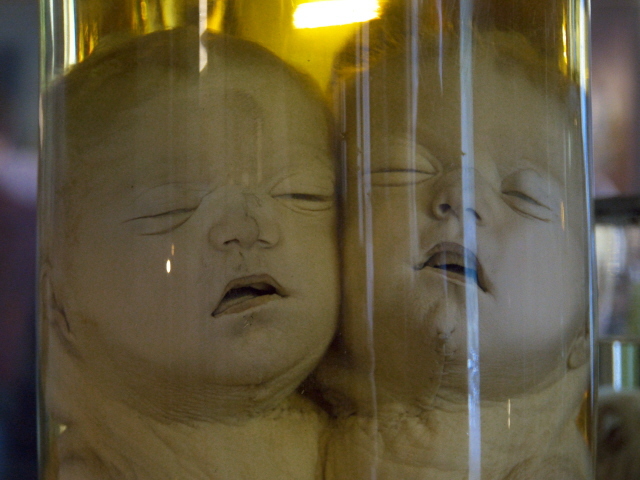 of conjoined twins, stuffed double-headed animals, various preserved abnormal body parts and, of course, all those deformed whole babies in jars. Lots of them. More than I have ever encountered anywhere else. 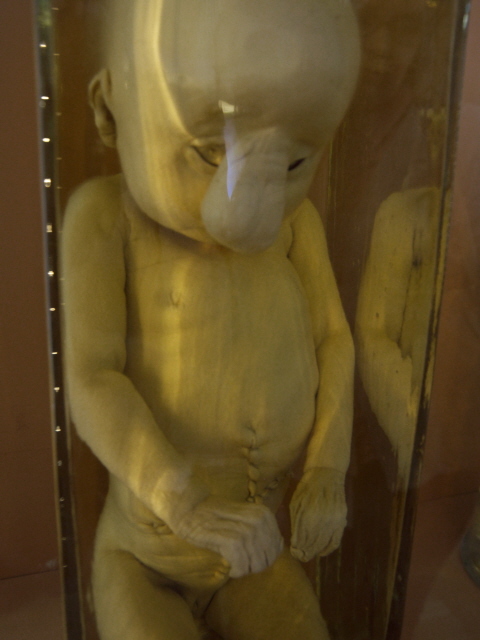 And so you can inspect a wide range of deformities: anencephalus, hydrocephalus, cyclops, or twins in different degrees of being conjoined – from two full bodies connected at the bellies to single bodies with four eyes or almost complete double heads. And yes, some of these are at least initially pretty gruesome to look at. 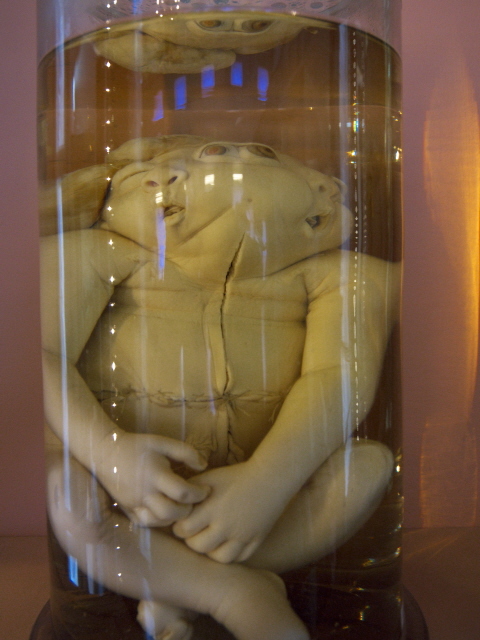 However, after a while I began to see the beauty in these “monsters” … some really came across quite angelic, silently floating in their jars (I had this before, especially at the Semey Anatomical Museum). I even began to see emotional facial expressions – but of course that's just my imagination getting carried away. But it is also allowed to, because in terms of medical information there isn't all that much labelling. Usually just short one-liners such as “cyclops fetus with underdeveloped limbs” and such like. But there are also a few larger text panels, e.g. about the history of “teratology”, as is the scientific name of the discipline studying malformation (from Greek “teratos” – 'monster'). Astoundingly, photography is permitted in this museum – very much unlike at other such collections like the Mütter Museum in Philadelphia or the Narrenturm in Vienna. That's why I can offer you an unusually wide range of photos in the gallery below that speak for themselves more than words could. One really bizarre aspect of this part of the museum is the strange juxtaposition of deformities in jars with taxidermy and stuffed fish suspended on wires or even a lobster mounted to the side of a display cabinet. I never found out why. The rest of the museum has little to offer in terms of what's dark, even though some of the masks in the ethnographic exhibitions appear somewhat scary perhaps. But overall I found those sections not especially interesting, though the interior design in the centre underneath the tower had much appeal, and some of the scientific instruments on display in that section were also intriguing. Overall, however, make no mistake: it is for those anatomical displays that you visit this place as a dark tourist. Be warned, though. I found it fascinating, but this isn't for everybody. Those with a weaker disposition who can't handle medical horrors so easily – and especially pregnant women – should perhaps think twice before going there. Location: in the centre of St Petersburg, Russia, just a stone's throw from the Admiralty and Hermitage/Winter Palace, just across the Palace Bridge at No. 3 University Embankment on the Neva River, but the entrance is the side street Tamozhenny Pereulok. Access and costs: easy to get to, but you may have to queue for a while to get in; not expensive. Details: from the very heart of St Petersburg it is easily walkable. The nearest metro station is Admiralteyskaya at the top of Nevsky Prospekt just around the corner from Palace Square and the Hermitage. From there simply head north and cross the Palace Bridge and turn left. Walk past the museum building and turn right into Tamozhenny Pereulok, where the entrance to the museum is. At peak times, queues form outside, as visitors are only allowed inside in batches to avoid overcrowding in the museum. Opening times: Tuesday to Sunday 11 a.m. to 6 p.m., last admission one hour before closing time. Admission: 300 RUB (students and pensioners 100 RUB), off-season between September and April free admission on every third Thursday of a month. Remarkably photography is allowed in the museum and is free of charge. You can download a museum guide app from the official kunstkamera.ru website. Time required: If you just want to see the anatomical collection, then half an hour might be enough (more if you're a keen photographer! ), but for the rest of the museum you'd need much more time than that. Combinations with other dark destinations: see under St Petersburg. 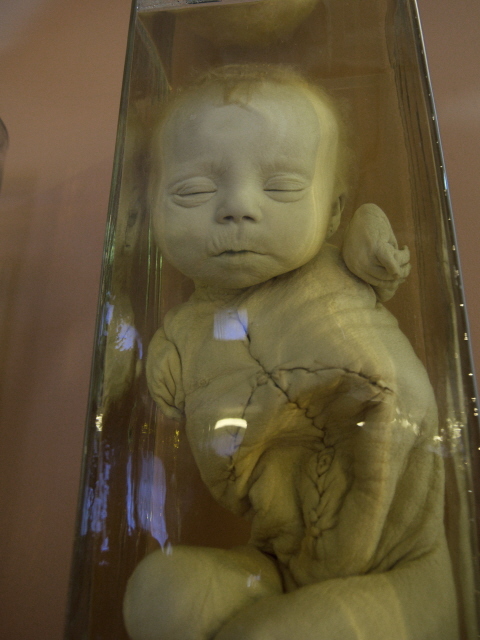 Combinations with non-dark destinations: The rest of the museum that isn't of the dark nature of the anatomical collection may be of interest to some broader-minded tourists too. There are plenty of dummies in various national dresses or ethnic outfits, hunters and their weapons, model yurts and all sorts of antique furniture, curios and bric-a-brac. The history of science is also given significant space here as the institution is actually part of the Academy of Science. Astronomy is a special focus, as is the collection of artefacts that belonged to or are associated with the pioneering Russian scholar Mikhail Lomonosov. One particularly noteworthy item is a kind of large round magnifying glass – only it doesn't magnify things but turns what you see through it upside down. Outside the museum you're not far from some of the city's principal tourist sights such as the Admirality and Hermitage just across the river, and St Isaac's Cathedral just to the south of these. And to the north-east of the museum, just two bridges and a 15 minute walk away is the Peter & Paul Fortress. See also under St Petersburg in general.